Faustus: Doctor Faustus is the leading character. He is a brilliant scholar in sixteenth century Germany. He has a thirst for knowledge, fame and fortune that runs so deep that he is willing to trade his mortal soul to Lucifer in return for cosmic powers. Faustus’s tragic grandeur is diminished by the fact that he never does completely come to terms with his decision to trade his soul and constantly struggles with whether or not he should repent. His drive is admirable, however, he appears to lack tremendous inner strength. Faustus never seems completely wiling to adopt his dark path. 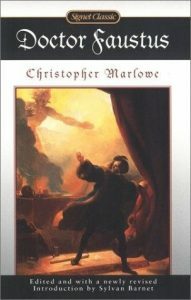 Mephistopheles: Summoned by Faustus, Mephistopheles is a devil connected with Lucifer and the rest of the underworld. His motives are ambiguous in nature. In part, he aims to capture Faustus’s soul, in another part, he attempts to discourage Faustus from making a pact with Lucifer by warning him about the horrors that lurk in hell. Chorus: A character standing outside of the story, delivering commentary and narration. The Chorus is a common part of Greek tragedy. Old Man: An mysterious figure appearing in the last scene, the old man pleads with Faustus to pray, repent and to seek mercy from God. He serves as a replacement for the angels of good and evil. Good Angel: A being of all things good and just, the Good Angel asks Faustus to repent his pact with Lucifer and find the path back to God. Evil Angel: A being of all things evil and unjust, the Evil Angel offers reasons why Faustus should continue his pact with Lucifer and not repent. Lucifer: The ruler of hell and the king of the devils. Wagner: Faustus’s servant, Wagner uses the magic he learned in his master’s books to summon devils and cast spells. Valdes and Cornelius: Friends of Faustus, also magicians, and responsible for teaching Faustus the black arts. Horse Courser: A horse trader who purchases a horse from Faustus. The horse vanishes while the horse-courser rides it into the water, prompting him to seek revenge. The Scholars: Colleagues of Faustus from the University of Wittenberg. They are loyal to Faustus and appear at both the start and the end of the play. They are dismayed by the direction that Faustus’s studies have taken and are deeply horrified to learn of his pact with Lucifer. The Pope: The pope is the head of the Roman Catholic church and a strong political figure in Europe. He serves as a source of amusement for the play’s largely Protestant viewers and also a symbol of the religion that Faustus has denied. Emperor Charles V: The most powerful royal monarch in all of England. Martino and Frederick: Friends of Benvolio, who join him in his attempt to slay Faustus. They appear only in B-Text.